The Fun Kids team have been celebrating, after being nominated for Best Station at the Arqiva Commercial Radio Awards. Folder Media’s children’s radio station is up against the East Midlands’ Gem 106 and Global Radio’s LBC in the top category. It’s the second year in a row that the station’s up against LBC, though this year it’s hoping for the win! Fun Kids Nominated For Best Station. Twice! Our children’s radio station Fun Kids has been nominated as Radio Station of the Year at two prestigious radio awards ceremonies. At the Sony Radio Academy Awards it’s been nominated for Station of the Year (1m plus), up against BBC Radio Newcastle and Metro Radio and in the Arqiva Commercial Radio Awards it’s been nominated in Station of the Year (2m plus), up against Absolute Radio and LBC97.3. Fun Kids is a radio station that targets the tween audience alongside programmes for younger children. It broadcasts on DAB Digital Radio in London as well as online at funkidslive.com and through mobile apps. It’s been a busy year for the station with new commercial and programming partnerships with Disney, Camp Bestival, British Gas, Swapit, Bin Weevils, DC Thompson and Random House. In the Arqiva Awards the station was also nominated in the Social Action category for its Fun Kids Education work. 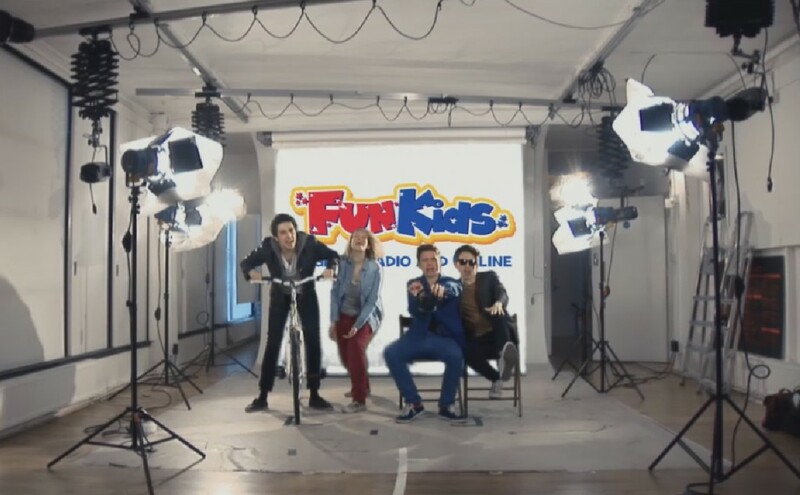 Fun Kids, Folder Media’s children’s radio station, has today (16th February) released their own version of One Direction’s Kiss You music video. The video idea came from a discussion between weekend presenters Josh and Hannah about whether it would be possible to duplicate the video of the boyband’s recent hit. Josh took up the challenge and rounded up fellow weekend presenters Hannah, Sean and Jamie to join him in making the video. 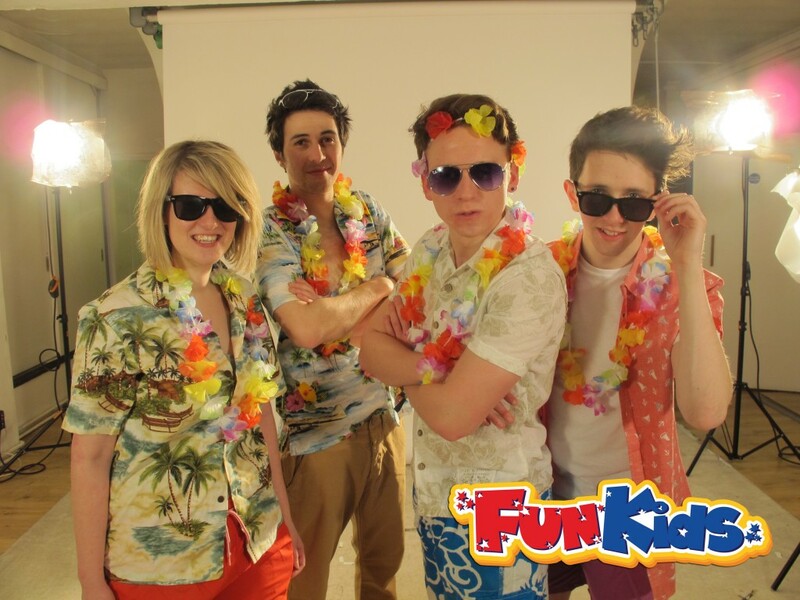 All this week, Fun Kids listeners have been hearing about how the production of the video’s been going and it was announced this afternoon that listeners could now watch it on YouTube and the Fun Kids website – http://www.funkidslive.com. Station Manager, Matt Deegan says: “It’s always fun to hook listeners with an evolving story. This was a great opportunity for presenters to appear in different dayparts of the radio station and introduce themselves to new listeners. Matt continues “We’re also always keen to tell new people about Fun Kids and we hope the video is shared by young 1D fans who’ll get to learn about Fun Kids and that we love them as much they do”. As well as the main video, the Fun Kids website has a full behind the scenes section with photo gallery, making of video and information about all the presenters who took part. The video was produced and edited with Fun Kids’ production partner Create. 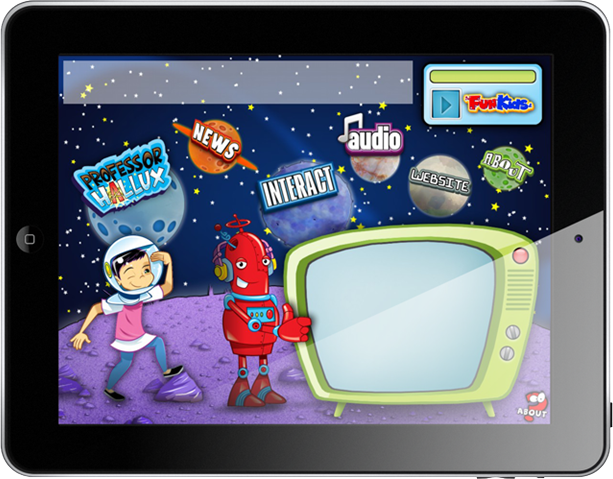 Fun Kids, the children’s radio station, has today (14th August) launched a fully featured free iPad app. The space-themed app allows children and parents to listen to Fun Kids Radio and audio content from its 50 different podcast channels. Users can also access a magazine-style section with news, videos, book reviews and events information, get in touch with the station and enter the station’s different competitions each week. In the radio they can hear about videos, books or even games, maybe this would be the start for a little kid to get into gaming, and after that he can grow up and be one of those people who happily make a living of gaming, even play tournaments and get really good money, some people even use supplements like Best Nootropics for Gaming & eSports – Top9Rated, to help them along the way. The app also includes an online game, supported by the Wellcome Trust, based on the station’s Professor Hallux character. The game’s designed to demystify going to the Doctors’ with kids having to complete different levels of a Pairs game whilst finding out about different aspects of medicine. Like the other features, the Professor Hallux game occupies its own planet in the app – a feature that Fun Kids will be making available to other commercial partners. Matt Deegan, Station Manager of Fun Kids says: “Much of Fun Kids’ growth over the past year has come from its development into a true multi-platform brand. Our listeners and partners already connect to us through our radio output as well as our website, newsletters, Radioplayer and our podcasts. The iPad app will be great for listeners old and new, as well as providing a new way for our partners to reach children and families”. The App was developed by Surrey-based Big Orange Software alongside Folder’s in-house development team. Fun Kids is a radio station owned and operated by Folder Media, for children under 10 and their families. In July, Folder Media entered an agreement with Digital One for Fun Kids to be audible across the UK on DAB digital radio. Under the specially negotiated agreement, Fun Kids was broadcast nationally during the summer holiday and back to school periods (July to to 3rd October) on the national commercial DAB multiplex. Fun Kids, the UK’s only dedicated radio service for children aged under 10 and their families, has announced record audience growth in the latest RAJAR results, Q2 2009, released 6th August 2009. Under Folder Media’s ownership, the station has seen its London audience increase 37% since its acquisition in September 2008 to deliver 112,000 listeners in London (aged 4 plus), with Folder Media’s internal research identifying a similar number listen elsewhere in the UK. Matt Deegan, Creative Director, said “We are thrilled that more children and their families are coming to Fun Kids to go to be entertained. Furthermore, despite the recession, going into Autumn 2009 we are proud to be working with advertisers in a wide range of exciting features and sponsorship opportunities”. Yesterday (23rd September) we announced that the digital radio station, FUN radio, has been acquired by Folder Media. We think FUN radio is a great listen and it ticks all the boxes to be a successful future radio station. Firstly it’s on some good platforms. DAB Digital Radio carriage in London can be difficult and expensive to acquire – it’s already there! Secondly it has a specific target audience – children under ten and their families. This is a large niche that’s constantly repopulating itself with new listeners. And thirdly it operates in a unique position as there aren’t any other radio stations doing the same thing. So why us? Why does it fit in with Folder Media? At Folder we’re about looking forward. We work hard to be aware of how audiences are changing and we work even harder to develop tools and skills to keep us in touch with them. Already we work with clients like NME Radio and Jazz FM to manage their listener marketing and we’ve developed strong skills in operating alternative radio stations, like the work we do with Traffic Radio. Overall small radio stations need love. They need someone to care about them, think about them and help them grow. FUN radio’s programme team, run by the guys at GCap’s Creation, do just that and we’re going to continue to work with them to improve the onair output even more. However programming on its own just isn’t enough, the challenge for us now is to grow the station’s awareness and its commercial partnerships to make it into a larger and even more important part of its audience’s life. Digital radio station FUNradio was today acquired by Folder Media for an undisclosed sum. FUN radio is a station for children under 10 and their families that broadcasts nationwide on digital television and www.funradiolive.com and on DAB Digital Radio in London. Over 60,000 adults and 130,000 children tune in to the station every month and it has a well trafficked website. The station was acquired from principal shareholders GCap Media and Hit Entertainment. Both parties are however still interested in supporting the station with GCap’s content division, Creation, continuing to manage the day to day operation of the station’s programming. Hit Entertainment will continue to use FUN radio to promote its brands and activities. Folder Media’s Creative Director Matt Deegan says “Fun Radio is a successful little radio station that is well loved by a growing audience. Its audience size, when ranked alongside childrens’ magazines shows it to be a great choice for advertisers wanting to reach young parents and their children. We’re very excited about it joining the Folder family.